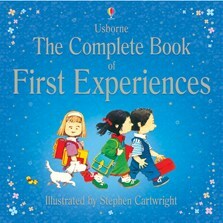 An essential collection of nine titles from Usborne's First Experiences series, introducing young children to key situations that they might be experiencing for the first time. Features Stephen Cartwright's gently humorous illustrations, packed with things for children to look at, learn from and talk about. First Experiences enjoyed in Greece! My 2 1/2 year old daughter LOVES this book! We have to read it every night before bed! Not only do the stories intrigue her, she loves looking for the little duck every time! I recommend this book, especially the small edition as she can hold it comfortably in her hands and it is easy to throw into your bag or purse when you go out! Isabella takes this book everywhere and most recently to her playgroup where the mum's there are now buying it for their kids! Fantastic book! Thank you!! !